Food, a necessary nourishment, is also subject to the volatility of fashion. Take for instance the Yeonsan Ogye black chicken. 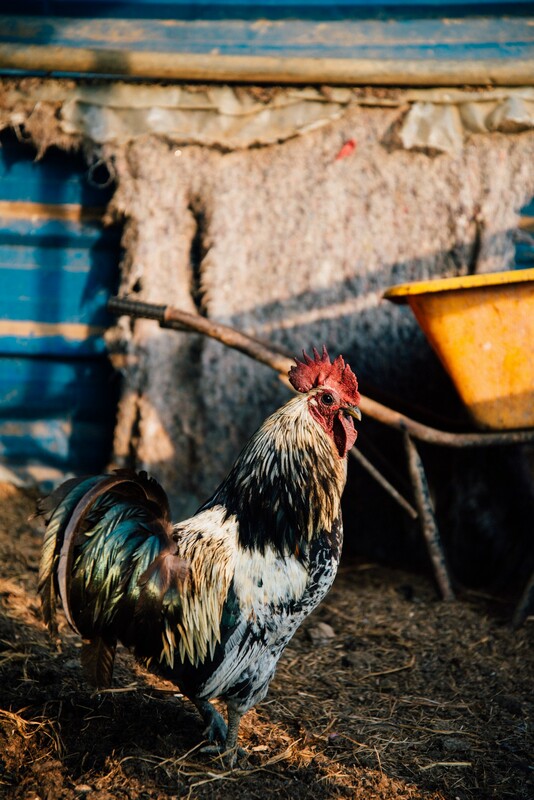 A breed of chicken native to Korea, it was a prized due to its royal connection and role as a medicine. 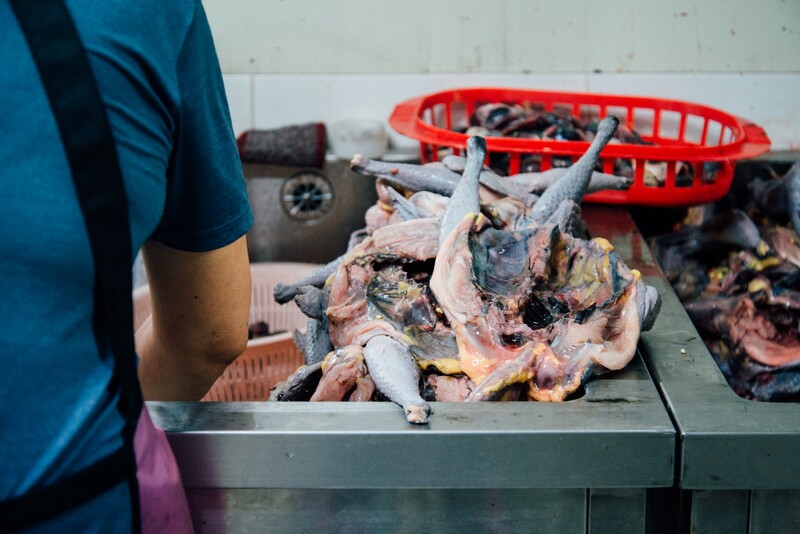 As the Joseon Dynasty came to a close, the breed’s shortcomings and the introduction of more efficient breeds of lean, white meat resulted in a lack of continued interest in keeping the breed around. 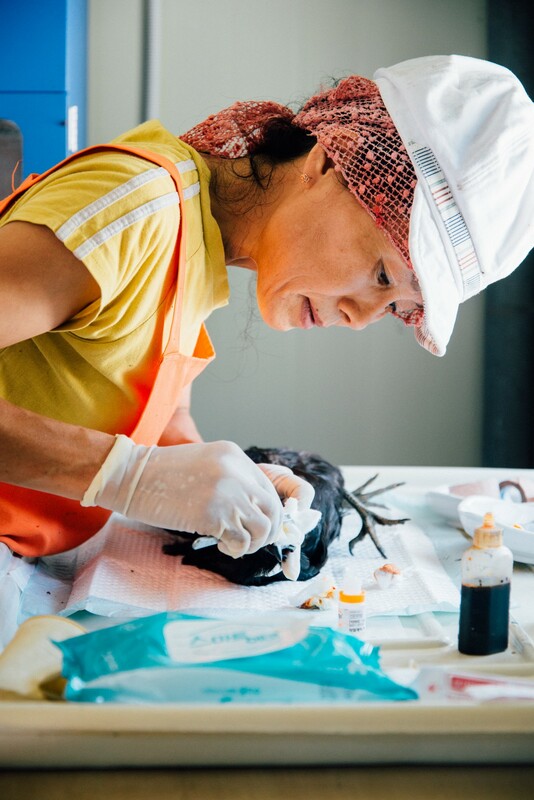 By all accounts, this should have led to the extinction of the black chicken species, but the passion of one family has helped to keep alive a piece of Korea’s incredible environmental diversity. 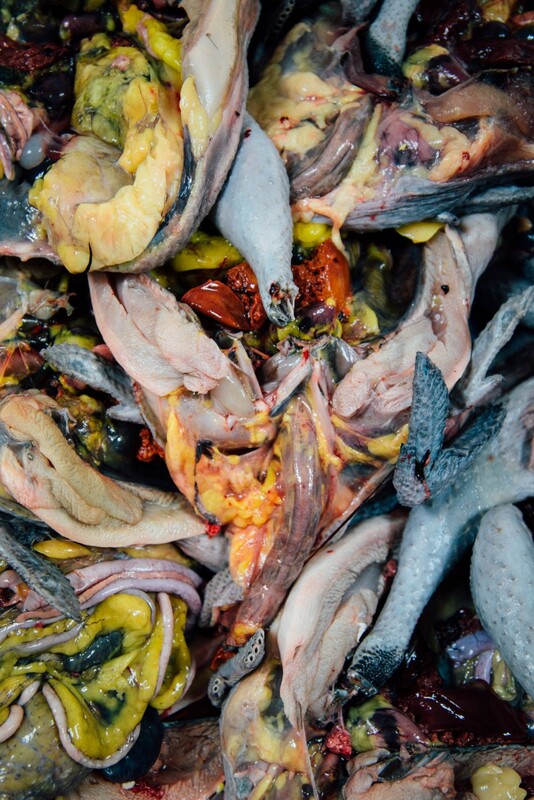 NOTE: The end of this post contains some graphic imagery of slaughtered chickens. Please do not continue reading if seeing these images may make you feel uncomfortable. The Yeonsan Ogye black chicken (연산오계), also commonly referred to as ogolgye (오골계), had long existed in Korea, with the name first being recorded during the Goryeo Dynasty (918–1392). However, the breed did not enter the realm of importance until the Joseon Dynasty (1392–1910). 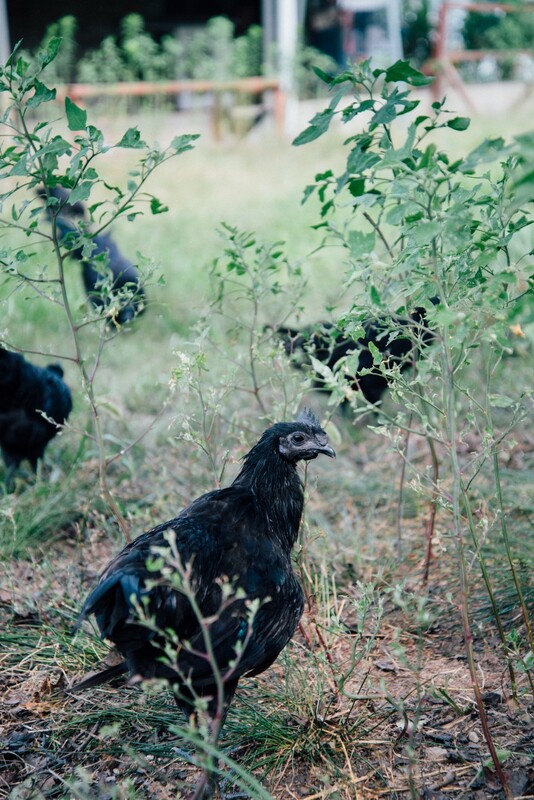 When the Lee Family ascended the throne, one branch of the family found itself cultivating black chickens. 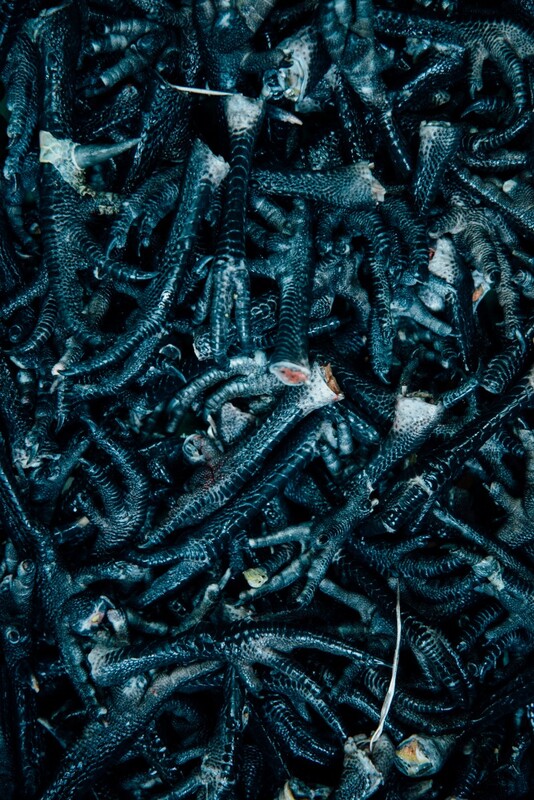 The Yeonsan Ogye was different from other breeds of chickens in that their eyes, body, feather, beak, crown, nail, and even bones were completely black. The chicken’s body shape was also particular to the breed. 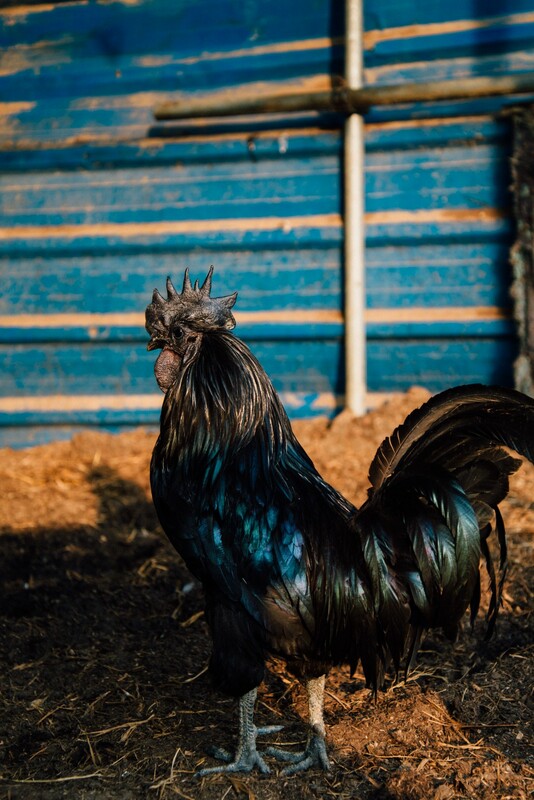 Among all the black chicken breeds in the world, the Yeonsan Ogye was also special in that they could not be moved outside of the Gyeryong Mountain Region without changing their physical characteristics. Although not proven scientifically, It led to the belief that aside from genes, the Yeonsan region’s soil, water, and plant life were vital to the black chicken’s distinctive traits. 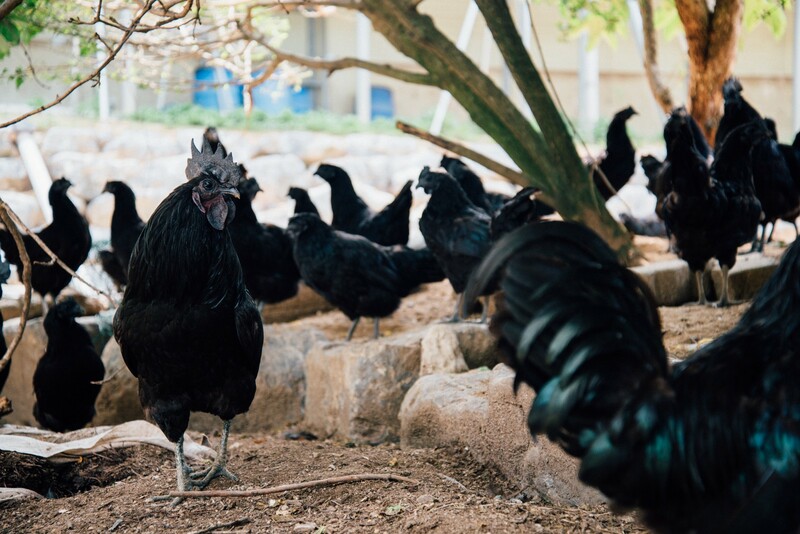 The Yeonsan Ogye black chicken’s physical characteristics set it apart from other breeds, but that was not the only reason why it was valued above others. 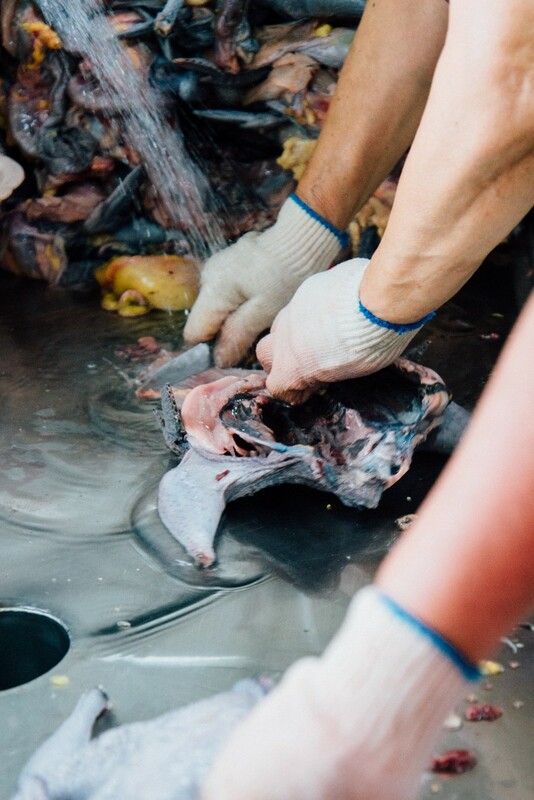 According to the medical book Dongui Bogam (동의보감) compiled by the royal physician Heo Jun (허준), parts of the chicken had the ability to cure human illnesses. LEE Hyeong-Heum, the fourth great-grandfather of Ogye Farm’s current successor, regarded Yeonsan Ogye not as simply a source of protein but as a medicinal ingredient to increase stamina. He eventually became the first person to serve black chicken soup, then considered to be good for health, to Cheoljong, the 25th Joseon King (1849–1863). The king enjoyed it so much, the consumption of the soup was henceforth restricted to the royal family. 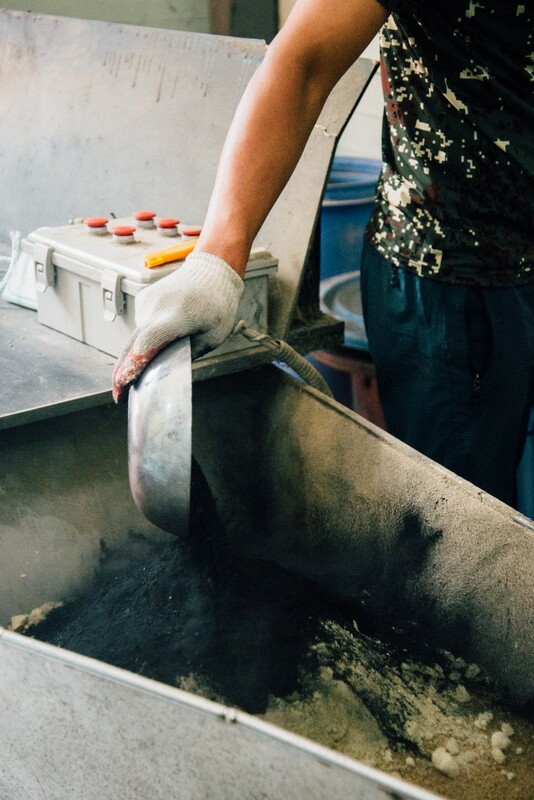 Since that fateful day, the expertise and knowledge of raising and preparing black chicken were passed down from parent to child, a 5-generation legacy that has been kept alive by the Lee family. But like all trends, the Joseon Dynasty ended, and along with it went the black chicken’s favour. Unlike other breeds of chicken, the Yeonsan Ogye was neither a quick grower nor an efficient producer of eggs. The chickens took around one year to reach maturity, a length five times longer than many other breeds, and only produced around two eggs per week. It should come as no surprise that the breed was classified as unproductive and less profitable than other common chickens. For the layman, the black chicken was useless — a symbol of wealth and power rather than a useful, domestic animal. 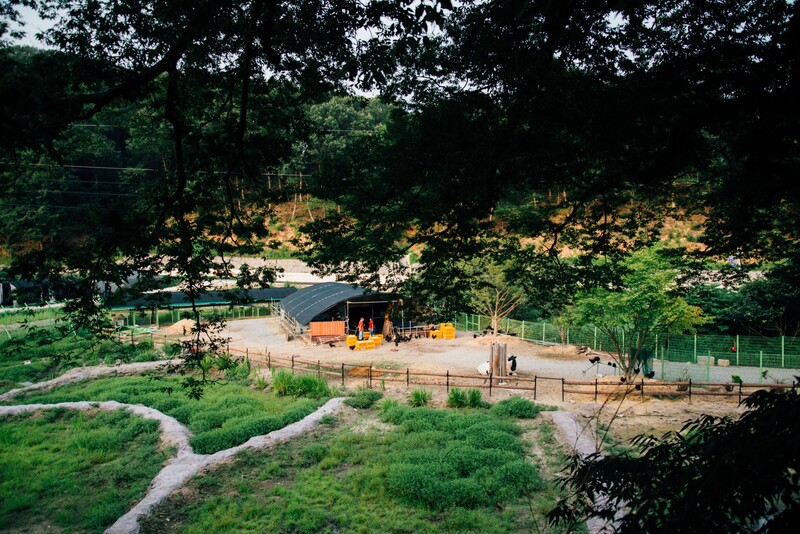 Almost all of the farms that were raising Yeonsan Ogye abandoned the once honoured breed, leaving only LEE Hyeong-Heum’s family to cultivate the species on their own. During the Japanese Occupation (1910–1945) and the years subsequent, the Korean government had little interest in its native assets. Under colonial rule, Korea’s identity was suppressed to discourage rebellion and labeled as inferior by the Japanese. After World War II, the nation was rebuilding, trying to catch up to the rest of the world in terms of power and prestige. Few resources could be spared to protect cultural assets, and in that moment, moving forward was more important than protecting the past. It was not until years later that the government began to rethink its stance on protecting its cultural assets. A result of that rethinking resulted in the recognition of the Yeonsan Ogye black chicken as the 265th Natural Korean Monument in 1980. The title did not result in any concrete changes for the Lee family that had until then been keeping the species alive at their own cost. 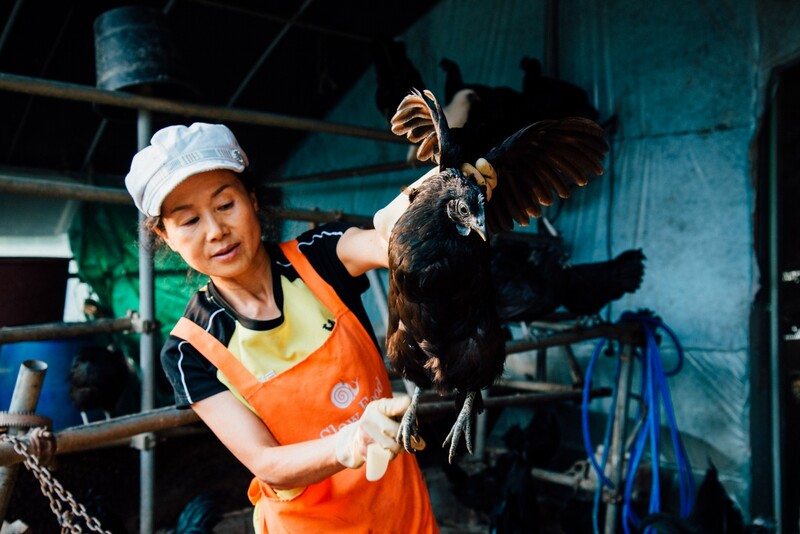 LEE Seung-Sook, the current head of Ogye Farm and successor to her family’s business, was not always interested in taking care of the black chickens. As an adult, she left Nonsan and worked what she simply called an “office job” in Seoul with little intention of ever returning. She could not figure out for the life of her why her father cared for the black chickens as if they were his own children. Suddenly in 1998, her father fell ill. 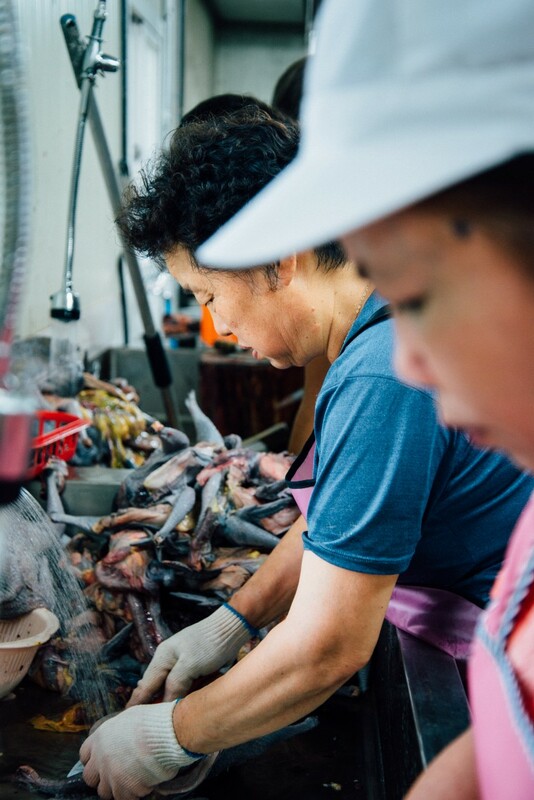 In an act of filial piety, she quit her job and returned to Nonsan. 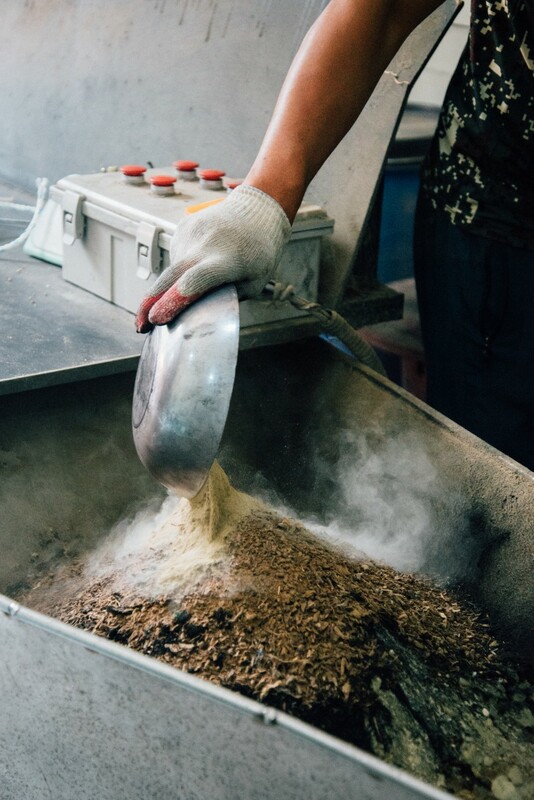 In the beginning, her intention was to simply care for her father, but in that process, she began to understand that he was not simply cultivating black chickens but that he was protecting his family’s legacy and an important part of Korean culture. When he passed away years later, Ms. Lees saw it as her duty to continue his work. Like her father, she raised and cared for the chickens at Ogye farm all at her own expense. Taking care of the chickens became her everyday passion, and as she liked to put it, her “destiny.” She saw the chickens as a mother would see her own children. She even titled her email handle as “ogyemom.” Taking care of the chickens was no easy task. On top of raising the healthy black chicken population, she was also caring for a population of handicapped chicks that were a result of the limited gene pool. Instead of ending the lives of chickens that could not live fully, an easy decision for most farms, she gave them a special place on the farm to live out the rest of their natural lives and gave each chicken individual attention daily. They were her “gifts in life,” and she used up all of her own resources to care for them. Her dedication to her chickens did not end in death. Beginning in 2010, she began to hold memorial services every April in order to commemorate the lives of all the chickens that had lived and to wish them a better life in their next incarnation. Due to the small gene pool, the chickens often develop mutations to their plumage. The difference in their genetic material is highly valued. 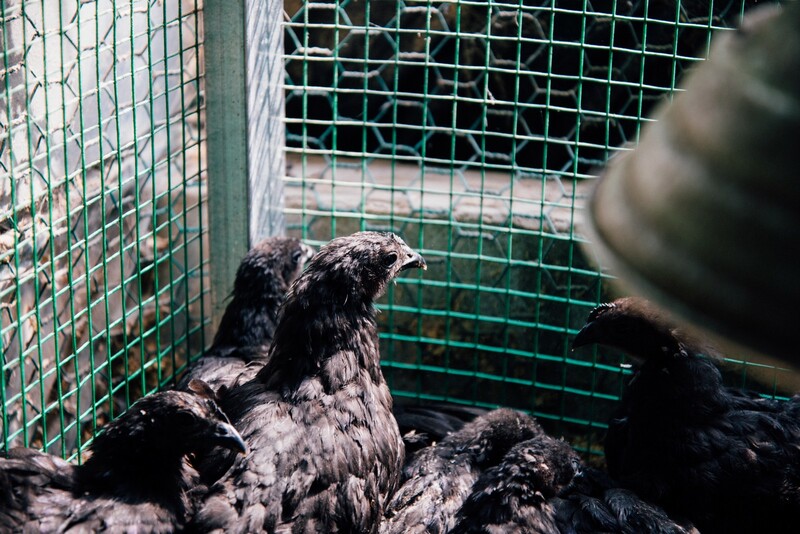 In 2011, the Korean government finally recognized their role in preserving the natural and culinary heritage encompassed by the Yeonsan Ogye and started subsidizing the farm as a way to protect the future of the black chicken species. Soon after, Slow Food International gave the species international recognition by officially placing it as a part of Korea’s Ark of Taste. Although to many, such a recognition would be meaningless since it did not result in more financial support, but to Ogye Farm, it was a sign that their family’s work was not in vain. Two years ago, Ms. Lee recruited more help in the form of volunteers through WWOOF Korea. Young travelers, budding farmers, and curious students worked alongside Ms. Lee and her staff on the farm in exchange for room and board as well as her knowledge and expertise. Her reason for joining was two-fold: firstly, she needed extra hands on the farm. She was not getting any younger, and the work was not getting any easier. Secondly, she realized the importance of educating future generations about the importance of biodiversity. If young people could not see the importance of maintaining native species, they would eventually perish from our vocabulary. 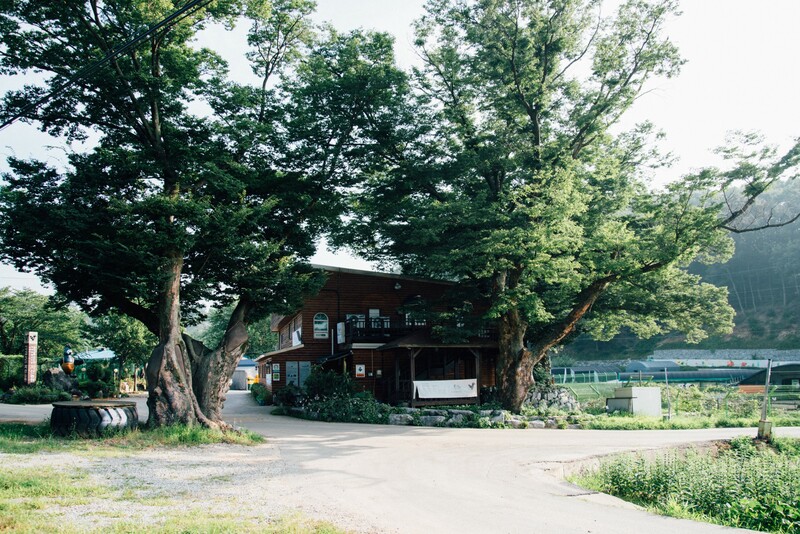 Since joining WWOOF Korea, she has hosted hundreds of people, teaching them the importance of native species to Korean culture and the environment and showing them the beauty of the Nonsan Region. Aside from being able to roam free and eat insects and foliage around the farm, the chickens are given a supplementary feed of ground, roasted ginseng, dried green tea leaves, ground oyster shells (calcium), ground carbon made from black chicken bones, microorganisms (digestive aid), ground beans, and organic chicken feed made from rice husks. All organic, of course. 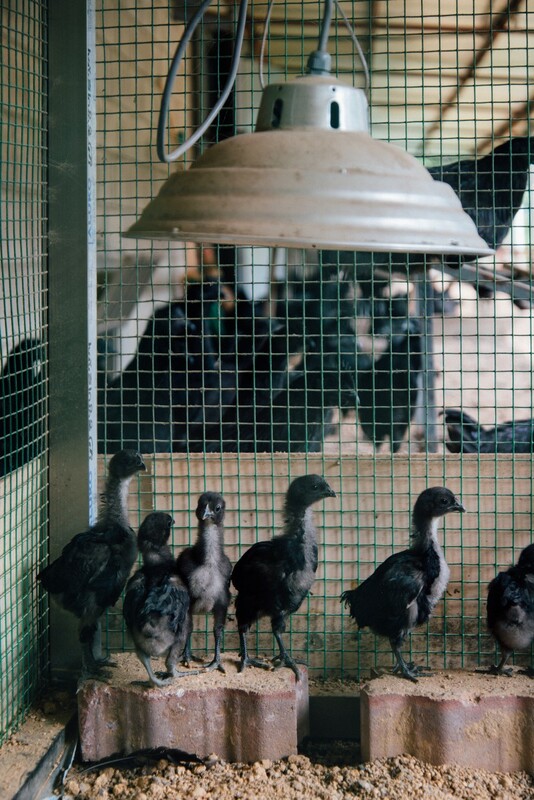 As of 2016, Ogye Farm is the last remaining farm that breeds true Yeonsan Ogye black chickens. The farm, despite its name, is focused on the preservation of the species. There are about 3000 chickens of various age on the farm, who have free range of natural areas as well as access to exceptional health care. They are lovingly fed an organic, 7-ingredient feed that includes ginseng and green tea and are even given a traditional Korean medicinal drink to ensure they are in the best of health. Despite their comfortable life as provided by Ms. Lee and her five skilled staff members, the future of the species is far from stable. The geographical and genetic isolation of the species makes it extremely vulnerable to disease and environmental conditions. 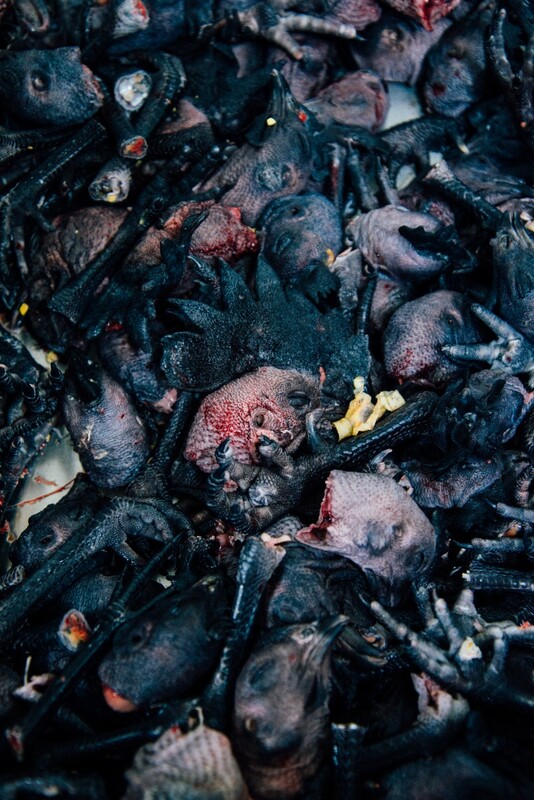 It only takes a single incidence of disease or natural disaster to wipe out the entire species. 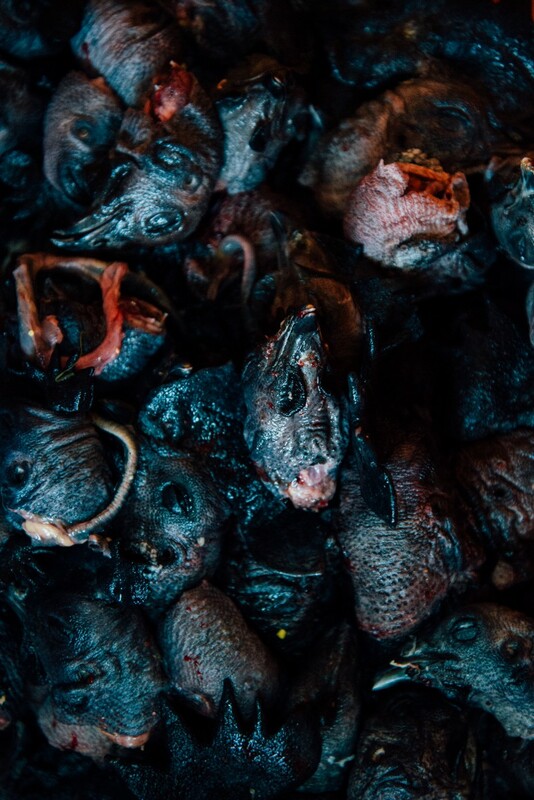 The histories of similarly isolated agricultural products (like the bananas of Honduras or potatoes of Ireland) paint a grim picture for the future of these birds. Having all of one’s eggs in a basket, and in this case, literally all the population of the species, in one location would be a folly. 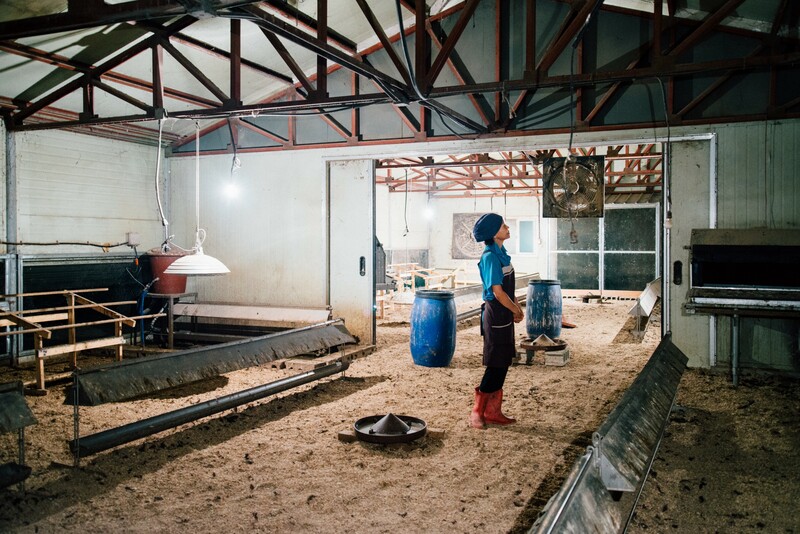 In order to prevent that scenario from happening, a portion of the chickens are moved to a second location to ensure that if one of the population should fall ill to disease, the other would be spared. 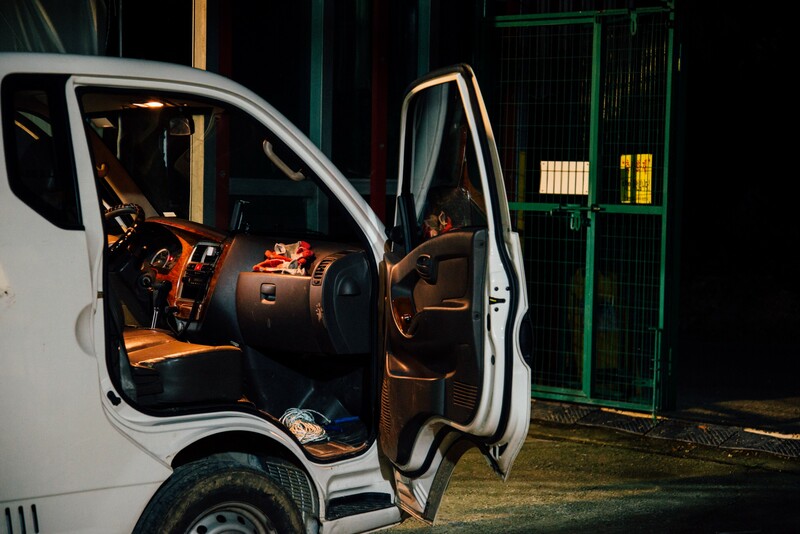 Such an event happens once every two years, and this past July was when the farm took measures against the threat of Avian Flu by moving half of the population to a location a few hours away from Nonsan. I had the honour of following the process as a volunteer. 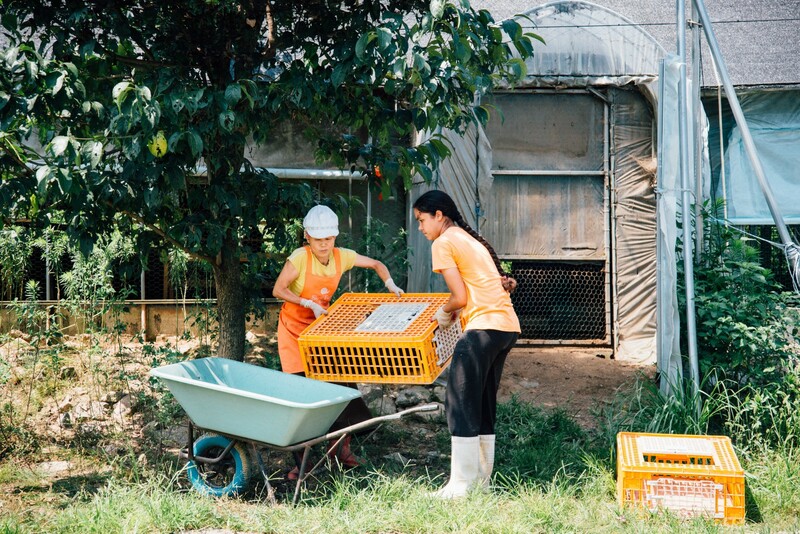 Once the sun had set on the chosen day and the chickens were calm, Ms. Lee, two of the staff members, and four volunteers took about two hours to scoop up all of the chickens in one of the many enclosed coops. 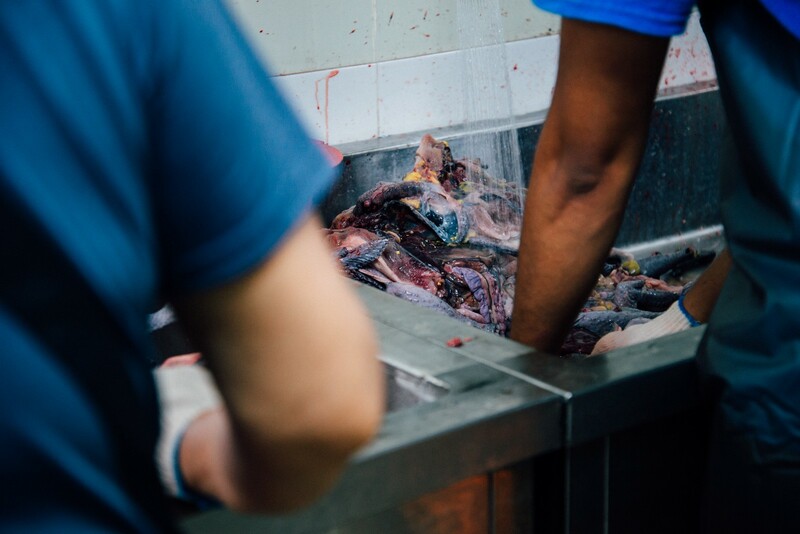 When the chickens were grabbed by their feet or by their torso, some were calm while others would not stop screaming even after the crate’s gate had closed. With 10 females or 8 males to a crate, they were uncomfortable to say the least. The process of moving the chickens, about 500 in all, continued as we struggled to stack all of the yellow crates on top of the truck securely. For some cruel reason, the crates stuck out less than 1cm, preventing the back of the truck bed from being secured. 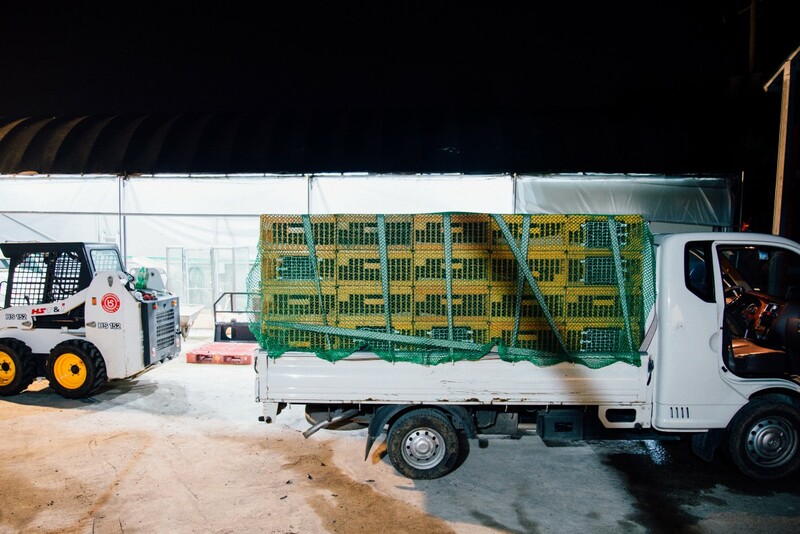 With all the strength we had left, we pushed and shoved the gate closed, finally securing the crates and their precious cargo about half an hour later, all while the chickens complained about the hot, cramped conditions. The chickens knew her voice. They immediately quieted down, not letting out another squawk until they were moved again. 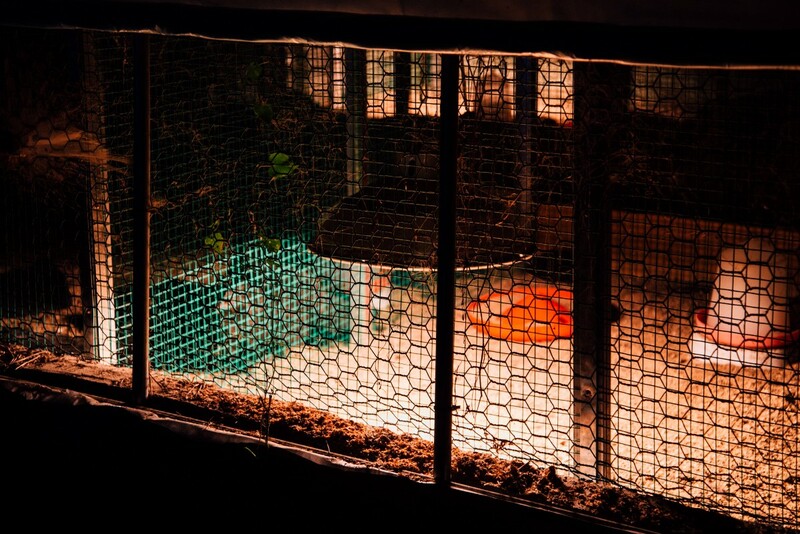 She talked to them every day and patrolled the chicken coops at night to ensure that no wild animals had gotten inside the enclosures. It was truly like watching a mother saying goodbye to her children. 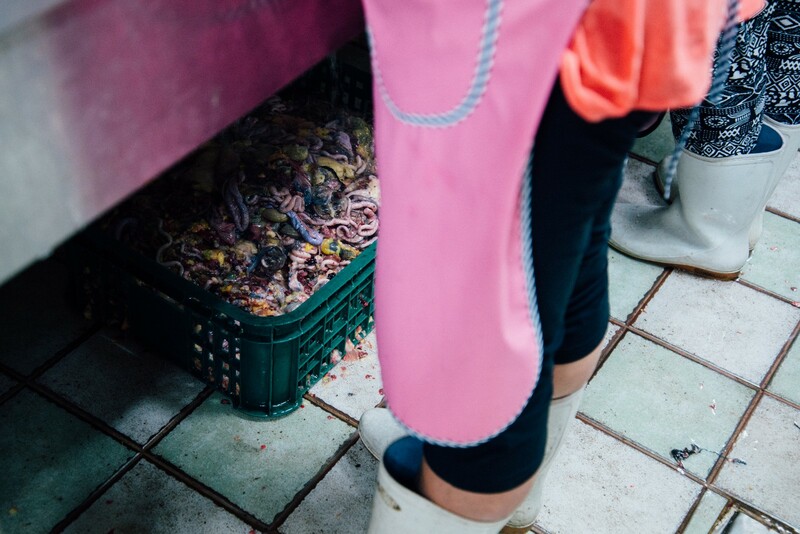 A few days after we had sent a large portion of the population away, a few hundred of the chickens were slated to be slaughtered to replenish the restaurant’s stocks. Although the black chicken was first bred for the consumption of kings, ordinary people have been enjoying black chicken soup for decades. 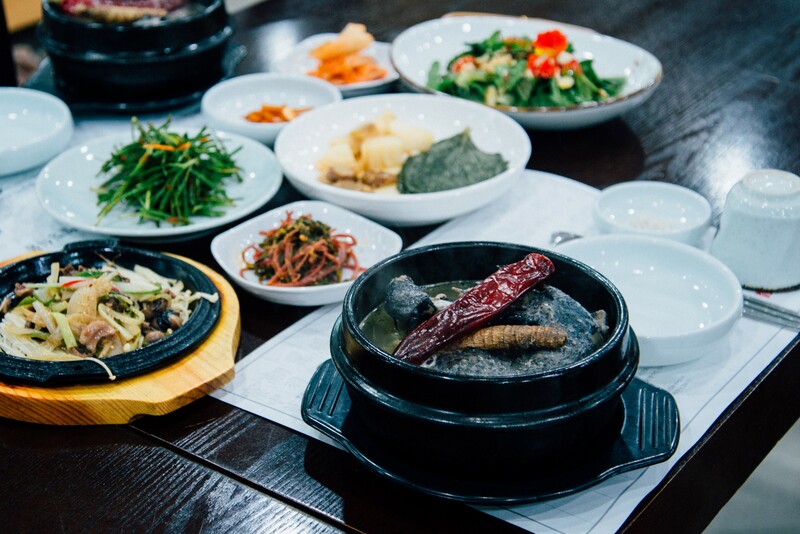 Chicken soup was a customary summer dish, and many people still believed that the consumption of Yeonsan Ogye could increase stamina. 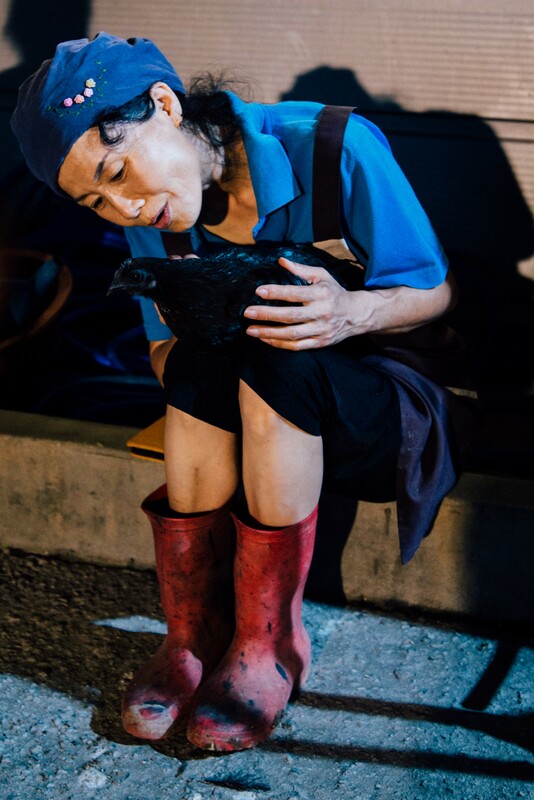 Three of her staff and four volunteers assisted that Sunday night, putting all the chickens that were not sent away to the other farm in crates for Ms. Lee to decide which ones to kill and which ones to keep alive in the morning. 8 females or 6 males sat in those yellow crates, lined up like burial plots in a cemetery. All alone, at 5 on Monday morning, she examined almost 2600 chickens alone. She lifted each body, weighing 3–5kg, out of his or her crate, and decided then and there their fate. She was extremely tired by the end — physically, of course — but the weight was also mental. 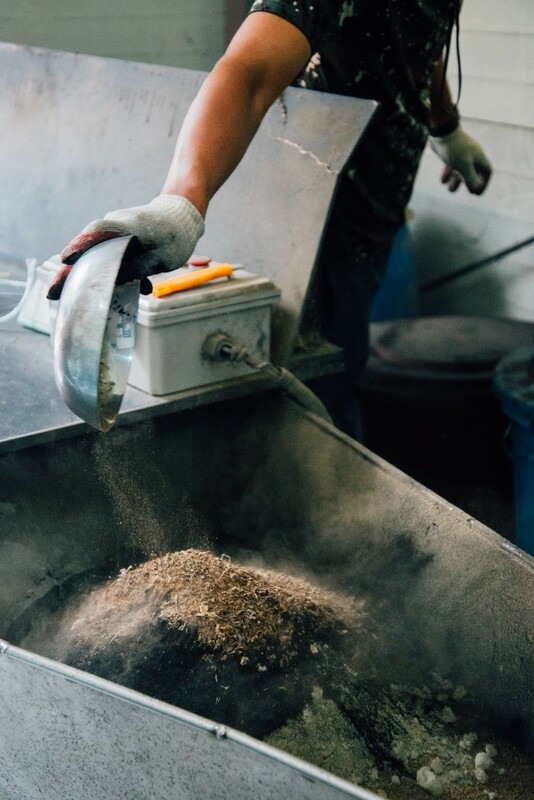 Later that morning, we staff and volunteers watched almost 400 chickens “sleep,” and then we defeathered and processed them to be frozen and later cooked. Ms. Lee was not present for that part of the process. Ever since she took over the family business, she has never taken part in the killing of the chickens. For her, the images I took were the first time she had ever seen her beloved chickens in such a state. Chickens are bred, killed, and eaten everyday — that is the reality— but these chickens were a part of her family and a part of her family’s legacy. She loved each and every one as if they were her children, all while knowing that in order for the species to live on and for more chickens to be born, some must die. Their deaths were a necessary sacrifice for the good of the species — she knew this well — but their deaths were still a burden on her conscience. If she had the money and the space, she would have like to just allow the chickens to live until the natural end of their lives. A life’s work now in its 18th year, Ms. Lee believes that caring for her chickens is not only her duty, but her destiny. The work, although tough, has given her meaning and purpose although she did not always believe it to be so. But like her family members before her, her time on earth is not infinite, and she too must some day pass on the responsibilities of the farm. I asked Ms. Lee what would happen to the farm after she passes away in the future. A morbid question, but a necessary one since until her, the knowledge associated with cultivating these chickens were passed from parent to child, and she has chosen to remain childless. Ms. Lee, knowing full well the burdens of shouldering a legacy on her own, hopes that a system of support would develop to keep the species alive. She wants not only individuals but the government to come together to create a system wherein the comfort of these animals would come before profit. She is wary of individuals being in charge as they would only think financially. Although the chickens are occasionally killed to feed the restaurant’s patrons, she does not want financial gain to be the priority. 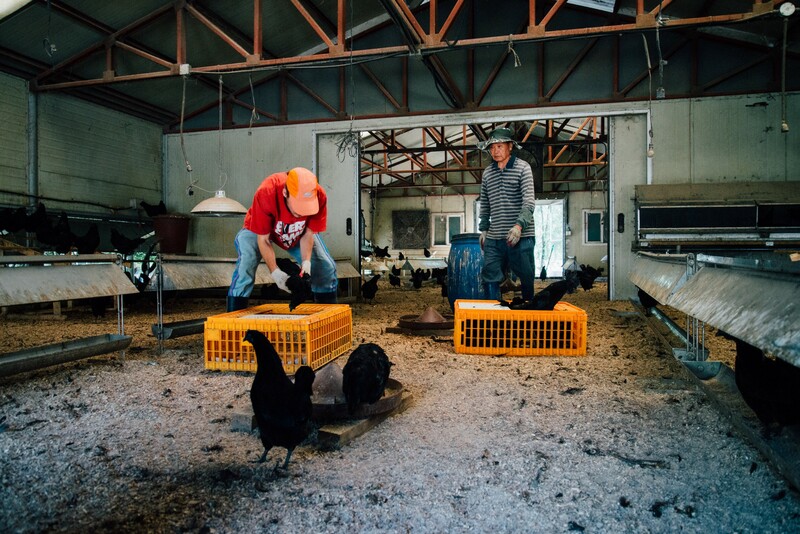 Not only are the Yeonsan Ogye black chickens her family, their true value is in their worth as a cultural asset. Through centuries of cultural, economic, and environmental upheaval that saw the extinction of many other native species, the Lee Family helped the Yeonsan Ogye survive. The species is not simply a collection of bodies but is an important symbol of native Korean culture. 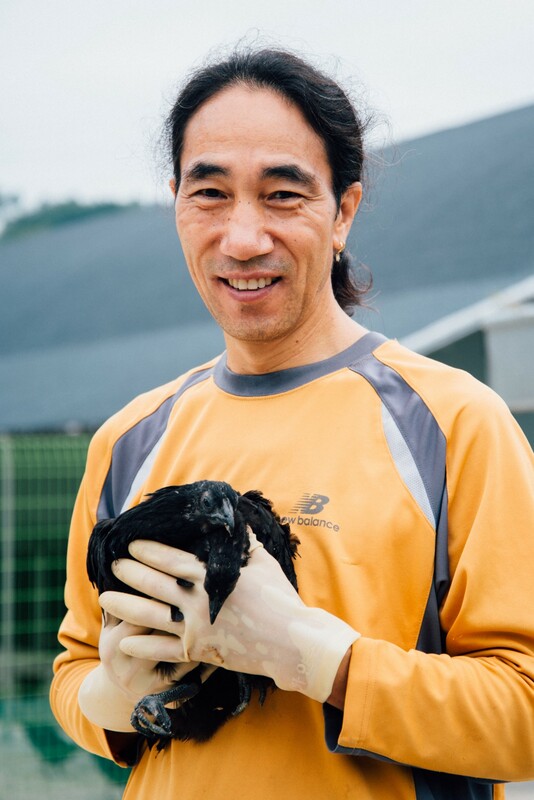 Interested in Yeonsan Ogye black chicken and LEE Seung-Sook’s work? 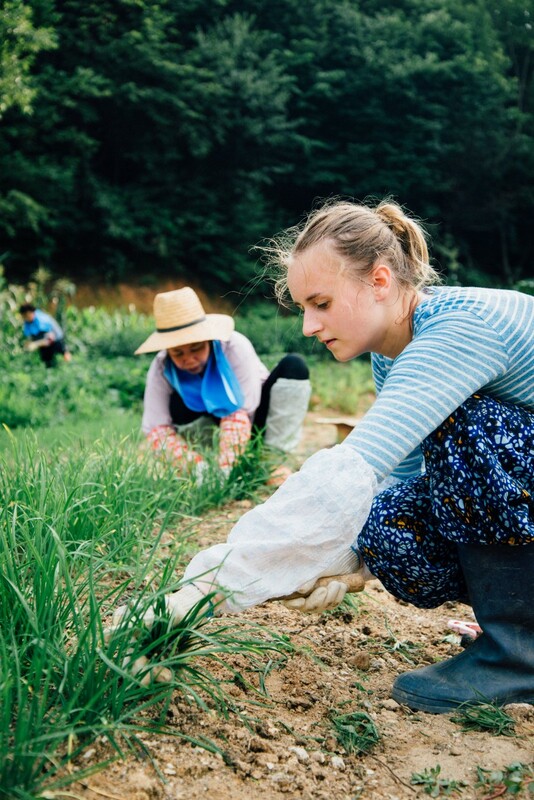 You can volunteer to work on Ogye Farm through WWOOF Korea or learn more about the black chicken through the Slow Food Foundation for Biodiversity. 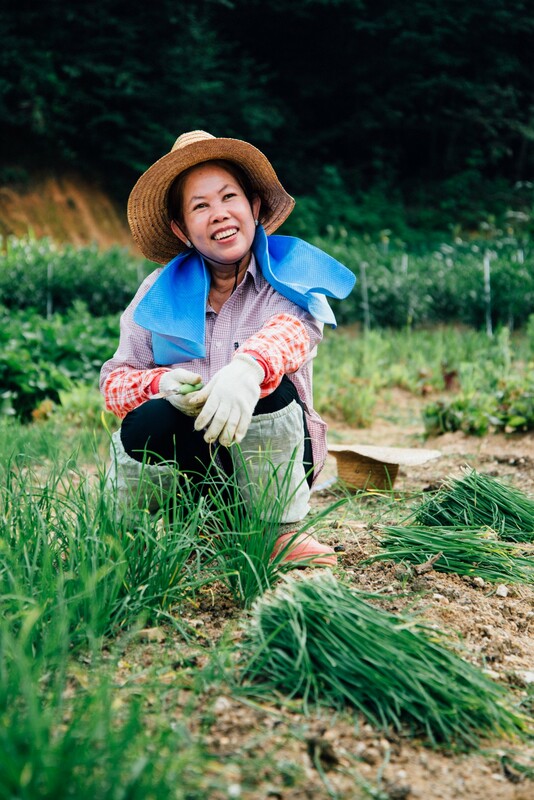 For more stories about South Korean organic farmers, follow me at Yolanta Siu on Medium or @sanlimyok on Instagram.